Wow, month 12, that came around faster than I expected. Everyone tells you how fast the time goes and to make the most of every moment, but seriously! I have a one year old! Madness. Rosalie is definitely becoming less and less like a baby and more like a toddler every day. She does this funny Mowgli type crawl now which is hilarious! She’s also taken to using her mouth to transport items such as cuddly bunny and Holly Bear, leaving her hands free for crawling; she looks like a puppy! She is such a daredevil now and is utterly fearless (because she is clueless of the risks) and watching her climb the stairs makes us feel simultaneously proud and terrified! Her ‘talking’ is really coming along – she has now started to say mamma, yay! Not that she associates the word with me yet. She is also really good at attempting to imitate sounds, such as the ‘s’ sound in snake, or when I say ‘brrrr, it’s chilly’ she tries to go ‘brrrr’. She also has started to do actions, so if we ask her where her head is then she places her hands on her head; if we say ‘how tall is Rosalie?’ she throws her hands high above her head; she also shakes her head and scrunches her face. 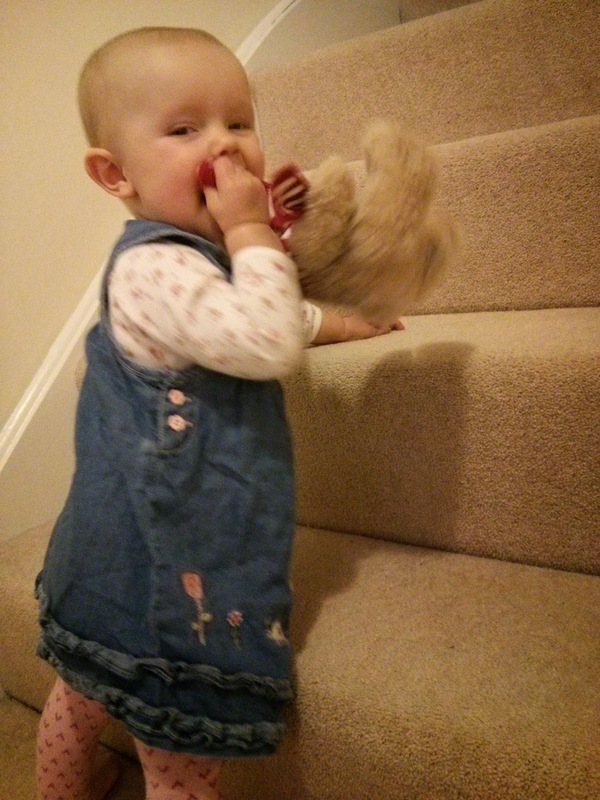 Rosalie at 51 weeks old, climbing the stairs with Holly Bear hitching a ride in her mouth.